Please welcome this awesome t shirt design vector pack. For $49 you will receive 50 cool, daring images that will make any apparel stand out from the crowd. Feel free to use them for online projects, or as prints for t shirts, pullovers, hoodies, etc. The key aspects they all share are creativity and craftsmanship, contemporary style and catchy look. 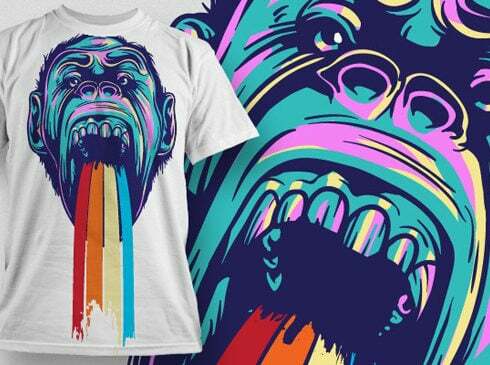 If you crave for attention-grabbing prints, this t-shirt design vector pack is exactly what you need. All items are created in vector format, so you can scale them infinitely, and their quality will remain unchanged. An extended license for these items allows you to employ them both in personal and commercial projects. 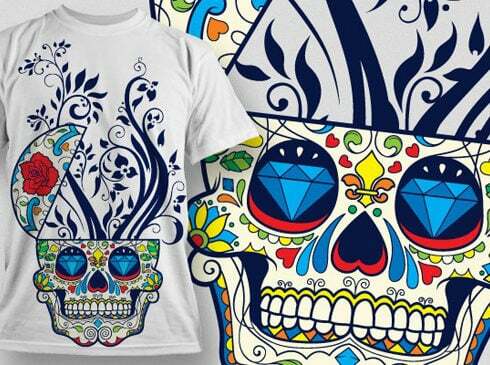 Don’t miss a massive discount for a great t shirt design vector pack. Make use of their visual power, and push it into your own unforgettable works. You can also use these designs for cups, hoodies, covers or any other print or web design! The number of colors is kept at a minimum to help you save on production costs too. You can easily change colors, add or remove elements, resize them or do anything that comes in mind! Usually all these 50 designs would cost you $500 which is a fair price for such a quality, but exclusively on MasterBundles you can get them for just $49 – that’s a massive 90% discount! What’s a graphic bundle deal? Each and every artist, as a skilled professional, undoubtedly should be able to sketch any image from scratch. It is unproductive, requires too much unnecessary time. That’s why almost all the designers use ready-made graphics elements – combine these graphic components, customize them and create the design . Noone is going to buy those components separately, so that’s exactly why they are put into graphic bundles and offered as a single solution. Are package deals of any use? For any single design job, you’ll need a lot of components – a few icons, a font, a few images, and so on. In case you would wish to purchase every one of them separately it will cost you a lot of money! So, that’s the reason experienced graphic designers usually go hunting for some graphic packages to purchase. They permit receiving a big handful of different elements for a very small price. Since all the packages are different from one to another, each individual designer will discover the required selection for a specific venture. Browsing them you’ll find the collections including illustration swatches, social media infographics, UI kits, business cards, plus much more. On MasterBundles.com marketplace, there are actually over 450 graphic deals to choose from. How can you save on packages? Are you looking for a 5% extra price cut on any collection from MasterBundles.com? Well, it is not that hard. All you have to do is just share the web page with a package on social media (Facebook). Any additional packages on MasterBundles? MasterBundles.com delivers you a large selection of different items. We sell not only graphics bundles but additionally about 20 other various kinds of products. Fonts, WordPress themes, mockups, icons, photos, illustrations, presentation templates and much more – on the MasterBundles it’s possible to find most of the products, required for a design. Exactly what is a watercolor package deal? The watercolor bundle is believed to be the lovliest development in artistic desgin. Hand crafted by painters on the a piece of paper, the pictures become scanned and added in a bundle as templates for projects. Watercolor elements are just great for wedding invitations, greeting cards, blogs, DIY and quotes. All pictures are very detailed and prepared for printing or digital use. The designers who like to work with photographs are going to be notably excited about the photo overlays graphic packages. They consist of selections of design elements that could spruce up and alter the photographs. This type of elements is laid over the photos to create some new and attention-grabbing look. MasterBundles has a significant variety of packages, stuffed with photo overlay elements. What’s an Instagram design template? In the digital era, many of us devote half our everyday life within social networks such as Instagram. Whatever objective we try to achieve using this network, we want to be noticeable in a crowd amid countless similar accounts. With high quality Instagram templates provided by MasterBundles, you don’t need to spend eternity while creating the outstanding appearance of your page. One of the deals will certainly help you focus on the artistic look of your Instagram page. Exactly what is an infographics package? If you require infographics for the business presentation in different industries through social media and marketing to medicine and schooling, the bundle is right what you have been searching for. Making use of the infographics package you will find yourself not wasting time which can be essential in terms of work efficiency. Each and every component is available in a separate file that may be edited in Powerpoint, Photoshop or Illustrator. What on earth is MasterBundles.com? MasterBundles is a marketplace that accumulates best design products from over the web and lets you purchase the design components you need in your work for a cheaper price .. Bundles this website carries are restricted in time, and that’s the answer why they are so cheap. MasterBundles boasts a big blog with the interesting design news and features explained.